In the spring, when our hands and lives were full with caring for a new baby, my mother came to visit for a couple of days. She was a huge help in so many ways. She helped me tackle some tasks that I just couldn’t find the time to do and also spent one whole day filling our freezer with meals. She made her famous spaghetti sauce, what seemed like gallons of Country Captain Chicken, and several meatloaves, perfectly portioned for 2 people. When she left, we had close to twenty meals in our freezer that could easily become dinner when the day hadn’t gone as planned or we simply needed a break from that daily task. It was a gift that offered both nourishment and time and I was more than a little sad when we baked off the last meal, a lone meatloaf, early this fall. Since then, I’ve made an effort to make large batches of some of our favorite foods to keep our freezer stocked. As we head into the busy holidays this has taken on a new urgency and this week I made turkey meatloaves. You can portion them as needed based on the size of your family, but tightly wrapped in plastic wrap and stored in a Ziploc bag, they make an easy dinner without the guilt. Meatloaves require lots of mixing and I find that a big bowl and latex gloves make this chore go quickly. Stirring with a spoon may lead to bigger biceps, but hands are your best tool and clad with latex gloves you can mix up the ingredients in this recipe in no time flat. When shaping the meatloaves, latex gloves come in handy as well; if using your bare hands, be sure to lightly dampen them with water to prevent the meat from sticking to them. The biggest challenge when working with large batches of food is getting the seasoning right. Use salt and pepper judiciously, but before you shape these meatballs cook off a small patty to taste for seasonings. 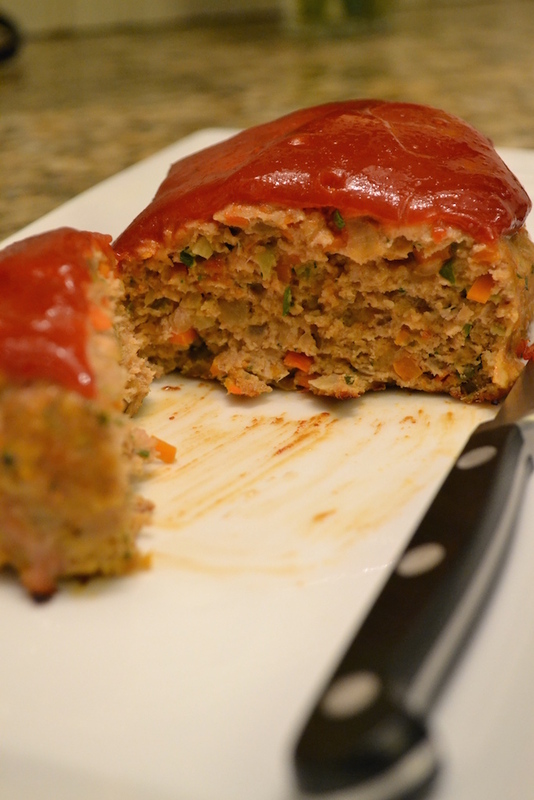 This simple step guarantees a good-tasting meatloaf and who doesn’t like a little snack for the cook? Happy cooking! Looking for other great freezer meals? Check out these recipes. Preheat the oven to 350 degrees. Heat the olive oil in a large skillet over medium-high heat. Add the onion, carrot, celery, ¼ teaspoon salt and 1/8 teaspoon pepper and cook until soft and golden, about 5 to 7 minutes. Stir in the garlic and cook until fragrant, about 30 seconds. Stir in the tomato paste and cook for an additional minute. Remove the skillet from the heat and let the vegetable mixture cool. In a large bowl, combine the ground turkey, the cooled vegetable mixture, the Panko breadcrumbs, Parmesan cheese, egg, parsley, the remaining 1-teaspoon salt and ½ teaspoon ground black pepper. Mix everything together with your hands (use latex gloves if you have them) and then divide into four equal portions (about 13 ounces each) or two portions (about 26 ounces each). Shape each portion into a small loaf. If making meatloaves for later, wrap the extra meatloaves tightly in plastic wrap and place in a Ziploc bag. 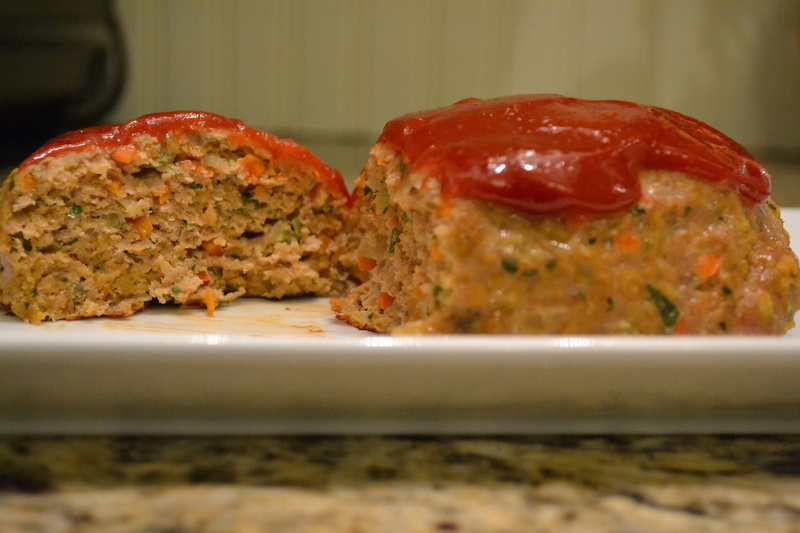 Don’t add the ketchup until you plan to cook the meatloaf. Label, date, and freeze. 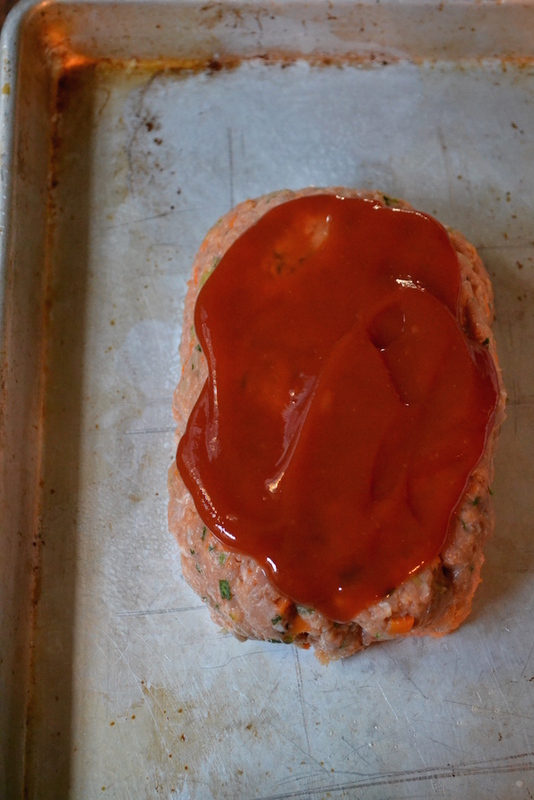 If cooking immediately, place the meatloaf on a greased baking sheet and spread the ketchup over the top. Bake for 45 minutes (55 to 60 minutes if baking larger loaves) or until the internal temperature reaches 165 degrees. Let the meatloaf sit for at least five minutes before serving. To prepare frozen meatloaves, move the meatloaf from the freezer to your refrigerator 24 hours before you plan to eat it to allow it to defrost. Spread the top with ketchup and bake as directed above.